Montres DeWitt is honoured to have been invited to participate in the Only Watch 2011 Charity Auction in favour of research programmes on the Duchenne muscular dystrophy (DMD), to be held in Monaco on September 22 under the high patronage and in presence of S.A.S. Le Prince Albert II of Monaco. After a first participation in 2005 and, in 2007, the presentation of the WX-1 (concept watch no 1), an exceptionally complicated horological piece of art, DeWitt is presenting this year yet another masterpiece: the X-Watch. Reversible is not enough ! X-Watch, reversible was not enough ! DeWitt therefore imagined a spectacular articulated “bonnet” in the shape of an “X” that partly covers the face of the watch. A typical DeWitt approach that intends to arouse curiosity by hiding some parts of the mechanism in a subtle game of layers. The “X”-shaped bonnet is activated by four push-pieces positioned in the upper and lower part of the case. 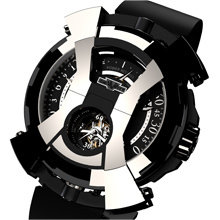 By pressing the push-pieces, the “X” separates in its middle and smoothly opens up to disclose the face of the watch. A special mechanism was integrated to control the speed of its opening. The rotation of the 49 mm Grade 5 Titanium case is only liberated when the “X” is in the open position. The case can then be flipped over and locked again by closing the “X”. Quite naturally, the “X” is designed in such a way that all the features of the watch remain perfectly readable even when the bonnet is in its closed position. In house is beautiful ! The X-Watch houses DeWitt’s third 100% in-house manufactured movement, Calibre DW 8046. One single reversible movement displaying bi-retrograde hours and minutes on each side and featuring an automatic Tourbillon, a Chronograph and a patented Automatic Sequential Winding (A.S.W.) device driven by a peripheral oscillating rotor. Built out of some 535 components, the calibre DW 8046 is the perfect illustration of the inventive audacity of DeWitt’s master watchmakers. A.S.W. or the art of mastering energy distribution ! The peripheral oscillating rotor is attached to a ring with a sinusoidal profile on its inner edge. This particular shape will, in turn, activate the patented A.S.W system which enables the movement to always operate in an ideal functioning range, between 92 and 96% of the main-spring torque. The main gear-train is therefore guaranteed to always receive a constant and stable flow of energy thanks to the sequenced winding of the barrel. Indeed, two little arms, rocking up and down the sinusoidal profile, ensure the winding of the barrel until it reaches 96% of the movement’s full winding. At that moment, a lever disengages the pawl from winding the barrel and forces it to continue its movement in the air, without hooking on to the wheel. The movement then runs on its reserves of energy, until it reaches 92%, and the pawl hooks back on. Such a technical prowess enables to obtain an ideal functioning range with the usage of a single, manual-type barrel. Moreover, it avoids all the running defects observed when slip-springs are used on conventional automatic calibres. The upper side of the dial is adorned in its centre with a rhodium plated and polished applique in the shape of an hourglass. In its upper part, a window displays a 120 degree power reserve indicator, an indispensable feature to observe the short back and forth movement of the hand when the watch is operating in its ideal functioning range and the A.S.W. is in action. In the lower part, the actual motor of this unidentified flying object is revealed through a nicely proportioned opening. A small seconds hand is attached to the Tourbillon cage and gently glides round. 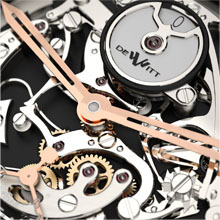 The hourglass applique is also decorated with the “DeWitt” logo, and elegant vertical lines remind us of the finishing given to the peripheral rotor (visible on the other side). In the background, a nice atmosphere is given by a sunray guilloche pattern that radiates right out to the two retrograde counters. 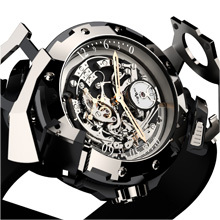 The hours and minutes hands are rhodium plated and positioned on the same axis. Both hours and minutes are read from bottom to top, with the hours West and the minutes East. When the “X”-shaped bonnet is closed, everything remains, except the mere symbol of passage of time, the hourglass. On the lower side of the dial, the hidden face of the X-Watch ! Operating on the same movement, a skeleton chronograph with disk seconds indication and a 3-arm minutes hand covering a 30 minute time span on 3 different levels. The peripheral oscillating rotor, streamlined and with elegant rose gold finishings, travels freely around the dial and is a marvel to observe. Since the crown and the two chronograph push-pieces must remain on the right hand side, the watch itself is turned by 180 degrees. The disk seconds indication, placed underneath the Tourbillon, is therefore now positioned in the upper part of the dial. A polished and rhodium plated cover is placed over the disk, leaving only a small window opening to display the passing seconds. The cover is also decorated with the “DeWitt” logo. The minutes, in the lower part of the dial and printed on the sapphire glass, are positioned on 3 different levels. A 3-arm rose gold hand with small disks on each tip covers the three 10-minute levels in a single rotation. In order to best valorise this skeleton side of the movement and its sporty twist, a blackened nickel silver plate 0.9 mm thick and with no less than 58 holes had to be placed in the middle of the movement to separate both sides. On this side of the watch, the positioning of the two retrograde hours and minutes hands on one single axis is also revealed. However, hours and minutes are now read from top to bottom. One single reversible movement displaying bi-retrograde hours and minutes on each side and featuring an automatic Tourbillon, a Chronograph and a patented Automatic Sequential Winding (A.S.W.) device driven by a peripheral oscillating rotor. Manufactured by DeWitt. Functions: Hours, minutes, seconds, chronograph and power reserve indication. Reversible, twin-faced case. Spiral: Straumann Hairspring® with Phillips curve sequenced at 3 Hz. Round-shaped, with traditional DeWitt imperial columns on the bezel. X-shaped bonnet covering the dial and activated by 4 push-pieces. Chronograph function activated by 2 push-pieces. Crown: Grade 5 Titanium polished crown adorned with a ring made in blackened titanium and featuring the “W” signature. Dial side: central applique in the shape of an hourglass. Background with guilloche pattern.